That is probably the best thing to do at this point. Get it running save .msq as "yourpickfilename" on desktop some where. Now you have a safe tune to always fall back on, if you make some good changes and there is no problems save that as your fall back. Don't make a lot of changes at one time, to hard to track what could be a problem if there is one. Pick one item get it dialed in and then move one. Start up and Idle is probably the hardest thing to tune , be patient. Open your current tune, Go to file and save tune as , select your desktop as the save location. It looks like your running wasted spark and semi-sequential or batch fire fuel ? then I can understand the msq you sent me. Is that using "Chevy numbering" or Audi numbering? Europeans use cylinder numbering conventions which are mystifying and illogical to those who grew up with Chevies. sounds like you may have a hardware conflict, could you be using the idle circuit to drive an injector ? MS2 extra doesn't have the same features as the MS3 so I am not sure of the hardware limitations. When I looked at your tune I only noticed a few things that may be an issue. Your required fuel should be rechecked, also in general settings it says you have 4 injectors and I believe you have 8. I also recommend changing your batch fire from 2 squirts to 4 alternating, 2 squirts means you have 4 injectors firing off at a time . How did you come to your dwell time ? if your coil near plug I say try 3.5ms at the least. How did you figure out your tooth#1 angle ? Lastly for your idle tuning turn off ego control , depending on your settings it could mess everything up. Wait till you get a WBO2 then you will have a much better idea of whats going on. I would not go out and load the motor till I had one. I am confused now, does it still run when you have your idle control disabled and then not work when you enable idle ? If so can you use one of your remote ports ? I know you are so close to running and eager but maybe send it in to DIYautotune and have them bench test it. See if they can recreate the issue , hell it may be a conflict in firmware that James has to look investigate . can you tell me more about your coils ? part number ? pull your FP fuse , go key on and use the output test mode - inj/spk. Test each injector at a time, Output interval 150 (800 rpms), pulsewidth 4 ms , Total number of injections 5. Start with Inj A (cyl 1) you should be able to hear it click or at least feel it. Continue to Inj B (cyl 5) so on so forth , do not fire the injectors dry to many times it may damage them. you can test your coils in a similar manor , Coil A (cyl 1) and Coil E (cyl 6) should both fire . Now in the test mode it may not be true but every coil should fire when selected. Coils A&E (1&6) Coils B&F (5&3) Coils C&G (4&7) Coils D&H (8&2) in wasted spark should fire together. Last note on tooth#1 angle , you found it to be 20 teeth from missing @ TDC. 2 things to know you can be anywhere from 114* to 126* depending on the rising or falling edge. You will need to verify your timing once your running with a timing light and timing marks. Also you could be 360* off, when you checked TDC did you verify it was on compression stroke ? if not could have been exhaust stroke. It shouldn't be a huge issue as your running wasted spark but may make a difference. is there anyway you can open your idle valve by hand a little ? without a WBO2 and a datalog I cant help much , but a hunting idle sounds lean to me. Is your narrow band reading in TS ? if so run a datalog and email it to me. on the slight surge in your idle I would guess maybe a little to much timing or still a little lean. get a WBo2 and tuning will be a breeze. Have you welded in braces for your modified cradle as we discussed earlier in the thread? It would be a shame to go through all of this and then have that cradle fold up the first time you took a corner. 1" square tubing? .060" wall thickness? 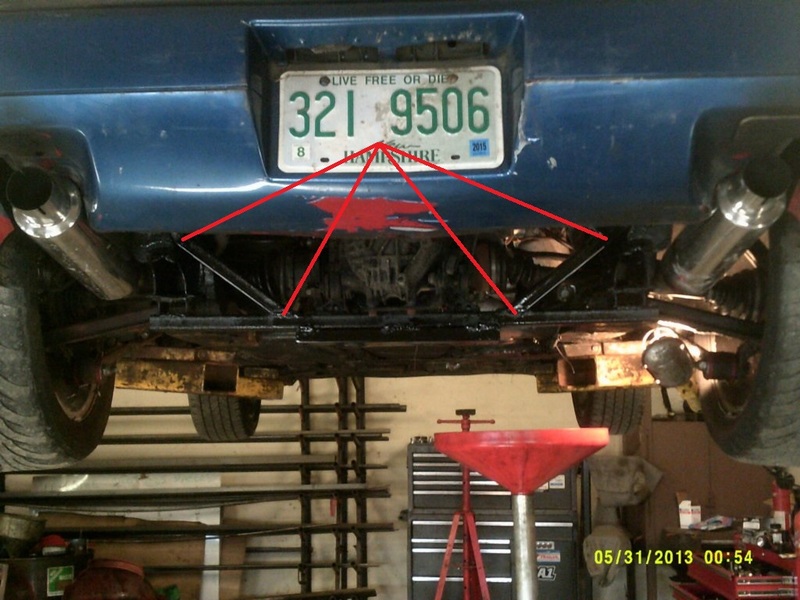 Looking at that vs. the stock rear crossmember on the cradle, I'd want a more extensive truss on your modified cradle. You may want to make a bolt-in brace that goes above the transmission. For example, if you're in a hard left corner, the lateral links are going to be pushing left on the right cradle rail. The way you have it now, that tries to bend the horizontal tubing in the middle. The way you have it now is better than it was... now you're depending on the bending strength of that square tubing. Before, you were depending on the bending strength of the 90 degree joint.